WE HAVE NEW PUMP TRANSITION PROGRAMS TAILORED TO YOUR NEEDS. Compare Animas® and Medtronic Pumps. As the chart below demonstrates, Medtronic insulin pumps share many of the same features as your current Animas® device. Depending on your future needs, there may be a Medtronic pump that helps enhance your ability to stay in range and helps improve the control you get from insulin pump therapy. Join the thousands of Animas® pumpers who have transitioned to Medtronic. The MiniMed™ 670G system offers SmartGuard™ technology with two new levels of automated insulin delivery — the Auto Mode and Suspend before low features. ACT NOW WHILE PROGRAMS∆ ARE AVAILABLE. If your pump warranty has already expired or is set to expire soon, you’re at risk of going off therapy should something happen to your Animas® pump. SWITCHING IS AS EASY AS 1-2-3. ∆Restrictions apply. Programs available to qualified customers with a valid prescription. Cost may vary based on warranty status, program eligibility and insurance coverage. Program terms and conditions are subject to change at any time and without notice. Thank you for being a Medtronic customer. For expedited service, we recommend you call 855-322-9568. While you consider your options, we also want to make sure you have discussed back-up options with your physician and received answers to any questions you may have. Animas® has arranged for in-warranty customers to transition to a Medtronic pump at no cost. Note: you must be in-warranty 60 days beyond the date you enroll. Call 855-322-9568 option 2 to learn more. If your Animas® pump is out of warranty or will be out of warranty in the next two months, please call 855-322-9568 option 1 to learn more about our programs and your options. Customers who choose not to transition to a Medtronic pump and continue to use their Animas® pump should be aware that effective September 30, 2019, Medtronic will no longer be able to supply Animas® cartridges or customer support for Animas® pumps, so you may want to consider alternative therapy options. Whether you’re an Animas® Vibe® or Animas® Ping® customer, rest assured you can now order your infusion sets, cartridges, and other supplies directly through the Medtronic Store. Finding your diabetes-related supplies and accessories just got easier thanks to the all-new Diabetes.Shop. Check it out today! Why did Animas® select Medtronic as their partner of choice? Animas® decided to close their insulin pump business in the U.S. and Canada in October 2017. Animas® selected Medtronic as the partner of choice to provide customer support to Animas® customers while they transition to new pump options through September 30th, 2019. Our first priority is to ensure there is no therapy disruption for Animas® customers given the significant benefits insulin pump therapy provides. As such, Medtronic has stepped up to provide support to Animas® customers by offering supplies and support along with offering pump transition programs inclusive of low to no cost options for eligible customers. Medtronic was selected because of our rich 30-year history of innovation and service. Medtronic has supported over 1.2 million people living with diabetes around the world. Medtronic customers have access to 24-hour technical product support, supply reorder services, and dedicated global customer support. Our unparalleled service is the #1 reason that people with diabetes stay with Medtronic. How will Medtronic support Animas® customers? Medtronic has taken over the support function for Animas® patients. Supply ordering and support has been transitioned to Medtronic as of January 2018. You can continue to use the same phone numbers to contact customer support for your Animas® pump, 877.937.7867. Where should I go now for my Animas® pump supplies? Animas® supplies can be ordered on the Medtronic Diabetes online store diabetes.shop, by calling 877-937-7867 or through your current distributor. Will my insurance coverage be the same with Medtronic? We anticipate no changes to your insurance coverage, but due to the individual nature of insurance plans, we will be able to confirm your coverage once you begin ordering supplies from Medtronic or its affiliates. I have the Vibe. How will this affect how I get my Dexcom supplies? You’ll continue to buy sensors directly from the company you are currently using. How does this impact my OneTouch meter and test strips? Will I also need to buy my OneTouch test strips from Medtronic as well? This only affects Animas® Vibe® and OneTouch Ping® insulin pumps and related supplies. There is no impact on OneTouch blood glucose meters and related supplies, which you can continue to purchase from your existing supplier. What happens if I am out of warranty? If you are out of warranty, Animas® will no longer provide service or a replacement for your insulin pump. This means you are at risk of going off therapy and back to multiple daily injections should anything happen to your Animas® pump. We would like to offer you an alternative option today to replace your Out-of-Warranty Animas® pump and ensure you do not experience a disruption in therapy. To learn about pump transition programs available through Medtronic, call 855.322.9568. What choices do I have if I am still in warranty? In-warranty Animas® patients have the option to receive a new MiniMedTM system for the remainder of their Animas® pump warranty period. Animas® has arranged for this transition option to occur at no cost to the patient to ensure continuity of therapy. Medtronic is now accepting enrollment for this program. The program is only offered for a limited time, and you must have more than 60 days left on your warranty to qualify. To learn more about the program or to enroll, call 855.322.9568 and select option 2. Customers who choose not to transition to a Medtronic insulin pump under this program can continue to use their Animas insulin pump; however, after September 30, 2019, Medtronic will not be able to supply Animas® supplies and customer support will no longer be provided for Animas pumps by Medtronic. To avoid the risk of going back to multiple daily injections, consider learning about your next pump options now. What options will my 8-year-old have once his/her warranty runs out? The MiniMed™ 670G system has been approved for ages 7+. Talk to your doctor today about your next pump. To learn more about the different pump transition programs, call us at 855.322.9568. We make it easy for our customers to stay connected with us and others in the Diabetes Online Community. Through our social channels, we share helpful diabetes tips, stories and perspectives from the community as well as from our Medtronic team. We count on our robust online community to give us feedback and help shape the solutions we innovate to help transform diabetes care so we invite you to join the conversation and stay connected with us! 1. Bergenstal R, Garg S, Weinzimer S, et al. Safety of a hybrid closed-loop insulin delivery system in patients with type 1 diabetes. JAMA. 2016;316(13):1407–1408. 2. dQ&A. (2017) dQ&A Patient Panel, Q4 2016, Summary Report. * Refers to SmartGuard™ Auto Mode feature; The MiniMed™ 670G system can automatically increase or decrease insulin delivery based on continuous glucose monitoring (CGM) values; however, the user must still administer meal boluses. ADA recommendation for a glucose range is 80-180 mg/dL in non-pregnant adults with diabetes. Individual results may vary. # Based on Guardian™ Sensor 3 glucose values. ∆ Restrictions apply. Programs available to qualified customers with a valid prescription. Cost may vary based on warranty status, program eligibility and insurance coverage. Program terms and conditions are subject to change at any time and without notice. § WARNING: Do not use the Suspend on low feature to prevent or treat low glucose. Always confirm your sensor glucose reading using your BG meter, and follow the instructions of your healthcare professional to treat low glucose. Using Suspend on low alone to prevent or treat low glucose may result in prolonged hypoglycemia. † At the time of manufacture and when the reservoir and tubing are properly inserted, your pump is waterproof. It is protected against the effects of being underwater to a depth of up to 12 feet (3.6 meters) for up to 24 hours. Insertion of a glucose sensor may cause bleeding or irritation at the insertion site. Consult a physician immediately if you experience significant pain or if you suspect that the site is infected. 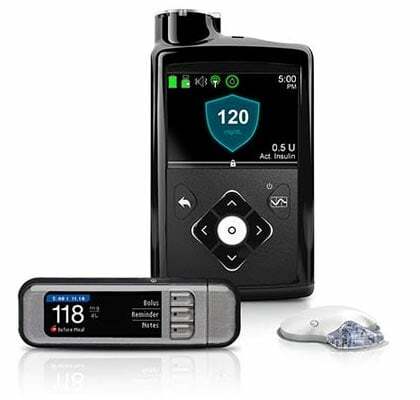 The Medtronic MiniMed™ 670G System consists of the following devices: MiniMed™ 670G Insulin Pump, the Guardian™ Link (3) Transmitter, the Guardian™ Sensor (3), One-press Serter, and the CONTOUR® NEXT Link 2.4 Glucose Meter. The system requires a prescription. The Guardian™ Sensor (3) is not intended to be used directly for making therapy adjustments, but rather to provide an indication of when a finger stick may be required. All therapy adjustments should be based on measurements obtained using a home glucose monitor and not on values provided by the Guardian™ Sensor (3). Guardian™ Sensor (3) The Guardian™ Sensor (3) is intended for use with the MiniMed™ 670G system to continuously monitor glucose levels in persons with diabetes. It is intended to be used for detecting trends and tracking patterns in persons aged fourteen years and older, and to be used by the MiniMed™ 670G system to automatically adjust basal insulin levels. It is indicated for use as an adjunctive device to complement, not replace, information obtained from standard blood glucose monitoring devices. The sensor is intended for single use and requires a prescription. The Guardian Sensor (3) is indicated for 7 days of continuous use. The Guardian™ Link (3) Transmitter is intended for use with MiniMed™ 670G System. The Guardian™ Link (3) Transmitter powers the glucose sensor, collects and calculates sensor data, and wirelessly sends the data to the MiniMed™ 670G insulin pump. The Transmitter is intended for single-patient multi-use. The CONTOUR®NEXT LINK 2.4 Wireless Blood Glucose Monitoring System is an over the counter (OTC) device utilized by persons with diabetes in home settings for the measurement of glucose in whole blood, and is for single patient use only and should not be shared. The CONTOUR®NEXT LINK 2.4 wireless blood glucose monitoring system is indicated for use with fresh capillary whole blood samples drawn from the fingertip and palm only. The CONTOUR®NEXT Test Strips are intended for self-testing by persons with diabetes for the quantitative measurement of glucose in whole blood samples from 20 to 600 mg/dL. The CONTOUR®NEXT LINK 2.4 wireless blood glucose transmit glucose values to the MiniMed™ 670G insulin pump and facilitate transfer of information to Medtronic CareLink™ Software through the use of radio frequency communication. The CONTOUR®NEXT LINK 2.4 Wireless Blood Glucose Monitoring System is not intended for the diagnosis of, or screening for, diabetes mellitus. It is not intended for use on neonates.